Over the past decade or so the risks relating to over-exposure to the sun are have been very well documented. The Solarmeter 6.5 is designed to measure the UV Index on a standardised scale giving and instant indication of the Sun's strength. 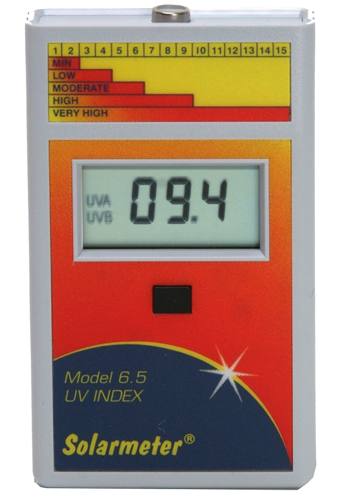 By regularly using the Solarmeter® you will become very informed of damaging UV levels in many and varied conditions. This knowledge, along with following the outdoor precautions mentioned above, should help enable you to avoid sun damage. 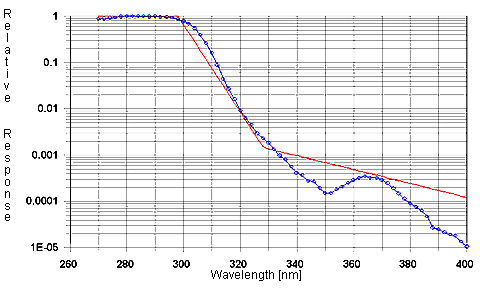 This unit is also becoming popular with reptile owners for checking bulbs used in reptile enclosures as the narrow band Eeff (EAS) response of this is very close to the Vitamin D action spectrum. It can also warn reptile owners when their lamps are “too strong” when the UVI is much higher than the reptile species basks in in their native environment, this is important because too much short wave UVB (which spikes the UVI meter) is bad for eyes. Stand clear of buildings, trees, etc. to obtain a "full sky" field of view. Hold the meter vertical out in front of your body. Press and hold button on front of meter case. Note reading on LCD. This value represents the instantaneous UV index. The highest UVI values typically occur when the sky is a deep blue color, and sometimes when the sun is between scattered white "puffy" clouds. Take extra precaution under these conditions to reduce sunburn potential. Note that various cloud and haze conditions reduce the UV index. When partly cloudy, take readings often and average clear with cloudy readings to correlate with actual UV index. Take care in hazy or slightly overcast conditions because although the direct UV reads less than when sky is clear, the diffuse UV can be higher... as seen by pointing the meter in various directions.